Kerakoll Adhesive Dealers BIOFLEX Flexible mineral adhesive to fix vitrified tiles and natural stones on floor and wall. Highly polymer modified. For balconies and terraces. Prolonged workability. A classy range of NITCO Polished Glazed Vitrified Tiles ( PGVT), Glossy Vitrified Tiles ( GVT) , Ceramic Tiles & Vitrified Tiles available to decore your home & workplace with a stone and natural feel textures gathered by the desgners to renovate giving a NITCO Look. 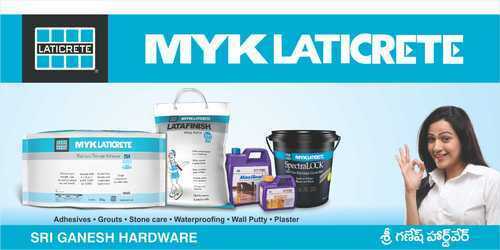 MYK Laticrete Tile Cleaner/ Stone Cleaner. Most suitable for cleaning various substrates such as marbles, natural stones, cementitious tiles, epoxy grout removal, efflorescence etc.